Thursday, June 14, prominent business, civic and community leaders and public officials will lend their voices to the prevention of domestic violence and sexual assault at the fourth annual pledge signing ceremony in downtown Pittsburgh. During the rally, these leaders will recite and sign a pledge to end gender violence at U.S. Steel Tower plaza, a new location for the annual observance. Groups of employees from several companies, including UPMC, Koppers and Ernst & Young, will also participate in the ceremony. The public event is hosted by Southwest PA Says No More, an initiative supported by FISA Foundation, The Heinz Endowments and United Way of Southwestern Pennsylvania. Thursday, June 14, 2018, 12:00 p.m. to 1:00 p.m.
Richard Harshman, Allegheny Technologies Inc. This event is part of a statewide campaign, an opportunity for men to take action and be part of the solution. 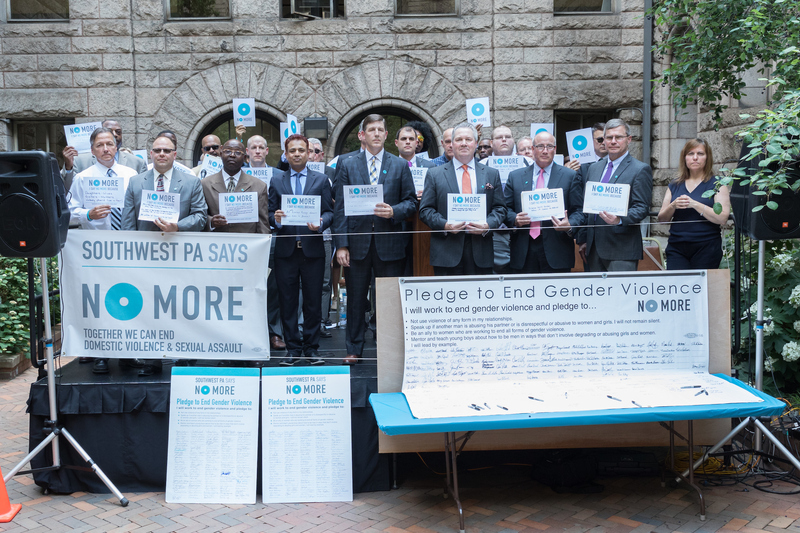 The Father’s Day Pledge PA campaign is organized by Pennsylvania Coalition Against Domestic Violence (PCADV), PA Says No More, and Southwest PA Says No More.